As we currently experience the decomposition of democracy, civility and privacy and the destruction of nature, it’s timely to reflect on the life of a thinker who in the 1930s and 40s engaged with trade unionism, the Spanish Civil War and the French Resistance while wrestling with her faith and the remoteness of God and who was embraced by socialists, Christians and atheists, Camus among them. To tackle the hard realities of the world and simultaneously seek transcendence, seems an increasingly daunting task. An opera in the 2019 Sydney Festival illustrates the challenge with a searing sense of emotional and spiritual turbulence leavened by moments of glorious musical flight. But before the words and music, we ponder in silence a striking large-scale installation. In the foreground is a conical, human-height mound of white rice. High above it is a gleaming metal hopper from which we imagine the grain has been poured. Behind, a vast stage-wide screen; to one side, a plainly attired woman, hair cropped short, facing it. Silence. 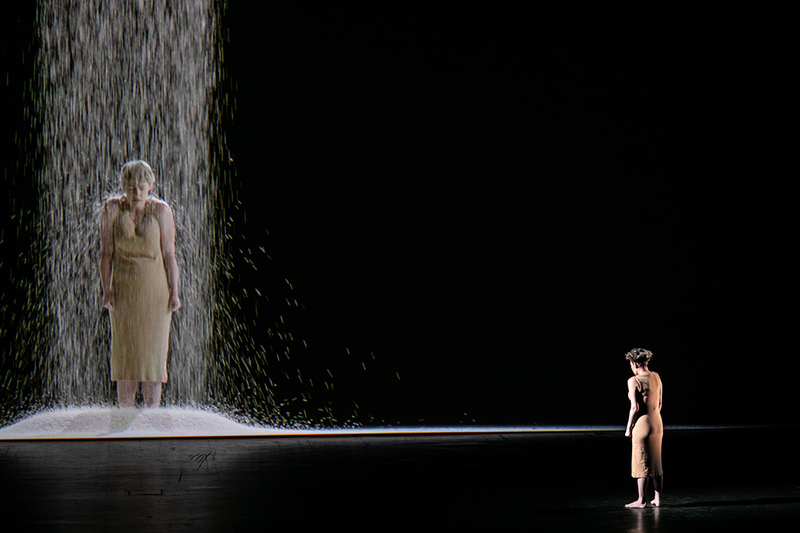 The same woman, now a giant presence, appears on the screen walking slowly towards us until halted by the fierce downpour of a column of rice (think Bill Viola’s The Crossing  in which a man gradually disappears within a descending rush of water) striking head and shoulders with visible impact as it accumulates around her. At once, Simone Weil’s philosophising is given body: the sheer, unremitting force of Gravity in the form of the falling rice is literally indicative of the weight of unavoidable human suffering and, as we’ll learn, a metaphor (the hopper a human construct) for institutions — the church, political parties — that oppress. For Weil, Gravity denies us Grace with which to ascend into the Light, the capacity to surrender ourselves utterly, with love, to an absent God in a theology without miracles or a life hereafter. When Weil’s compassion for the poor and oppressed everywhere (if neglecting herself and her immediate family) is invoked, the column of falling rice is multiplied immersively across the full width of the screen. When we are told Weil dies of starvation in London (the result of minimising her eating in sympathy with the war-time French population), her face, eyes meeting ours amid the tumbling rice, fills the screen with seeming serenity. The grains flurry, their increasing density evoking atoms, stars, a depthless cosmos into which Weil disappears, at one with the Light. At the very same time, orchestra and singer counter with unease as Weil’s spirit departs. Video artist Mike Daly’s series of continuous, evolving images provides a simple structure against which the complexities of Weil’s life and her vision play out in the queryings (in French) of the Singer (soprano Jane Sheldon), Weil’s own words (spoken by Sheldon; in the original production in Vienna delivered by a Reader), a Chorus (The Song Company, resonantly echoing telling phrases like a fascinated public) and, above all, the voice of the orchestra, a grand narrator conjuring machines, war, the hocketings of a wracked soul, recurrent slides into despair, moments of contemplation, flight and provisional transcendence, generating a fraught cosmos within which the soprano soars and falls between Gravity and Light. Moreso than Saariaho’s other operas, La Passion de Simone bristles, shimmers and thunders; above all it is percussively propulsive, conductor Jack Symonds perfectly capturing the alternations between Weil’s manic sense of urgency, sinking defeat, floating release and the Singer’s querulous probings. This provides La Passion de Simone with an emphatic dramatic pulse. In her program note, director Imara Savage writes that the makers of this production of La Passion de Simone decided to realise it as an art installation. The minimal sculptural and screen imagery and the Singer fixed to one spot compel a heightened focus on the interplay of words and music. 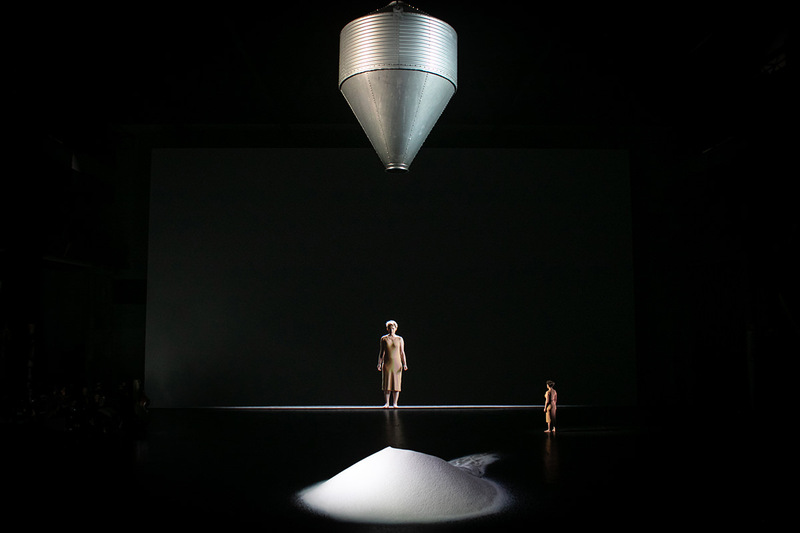 Since at least Robert Wilson and Philip Glass’s Einstein on the Beach (1976), use of installation has been a viable means of reinvigorating opera, not least where conventional dramatic composing and libretto-writing have vacated the idiom. Amin Maalouf’s libretto for Passion is minimally dramatic, sparely focused on ideas and offering little detail of the life of its subject. If the libretto inclines to abstraction, Kaija Saariaho’s intensely vivid score induces a profound listening experience, if bound by Maalouf’s text; but Sydney Chamber Opera shows how a satisfying dynamic between words and score can be realised. In the poorly received 2006 premiere production (full orchestra, large Chorus and Reader, the latter onstage) in Vienna, director Peter Sellars added a dancer who moved in tight, angelic sync with the soprano. In his tauter 2016 chamber version (Ojia, California), minus the dancer, a physically vigorous Singer also recites the Reader’s words from a book while a human-scale screen reveals abstract light images behind her, suggesting varying emotional and spiritual states. A Chorus of four stands close by, like a panel of alert commentators. As the production progresses, the Singer, despite her doubts, increasingly identifies with Weil and with physical consequences, including falls. In Sydney Chamber Opera’s La Passion de Simone the Chorus sits amid the low-lit orchestra, which is positioned to one side of the stage image, while a pre-recorded Sheldon is heard as if Weil herself is speaking rather than via a Reader. The visual absence of Chorus and Reader as palpable presences (though aurally substantially felt) narrows this world to one in which the singer and her identical screen-self, face to face, become a complex, tormented entity, true to Weil’s state of being. This Singer is no interlocuter on our behalf. The result is a closed circuit, a visual and aural monodrama, a minimally performative installation, the action essentially onscreen. Just as the onscreen Weil is realised in terms of durational performance with the punishing fall of rice on a vulnerable but unyielding body, so too does the Singer, locked in her sole standing position for 75 minutes, display the effects of unremitting force; but the source is internal, requiring the soprano to empathically quake from the very first scene on and with escalating force. This is accompanied by recurrent gasps that cut across mood and music, underestimating the capital S stoicism that is integral to Weil’s vision. The passion in the sung score is superbly conveyed by Sheldon without needing this pre-emptive excess of sound and movement (some simple physical patterning mapped in the way the video is structured might have offered the singer and audience a subtler responsiveness). Inevitably, it feels that the wracking of the body is more acted than felt, a theatrical impulse at odds with the makers’ non-dramatic conception. Despite this, Sheldon won me, her singing at once crystalline and impassioned, plangently lyrical and passionately operatic, evoking the sheer intensity of the Singer’s quest to understand and empathise with Weil. 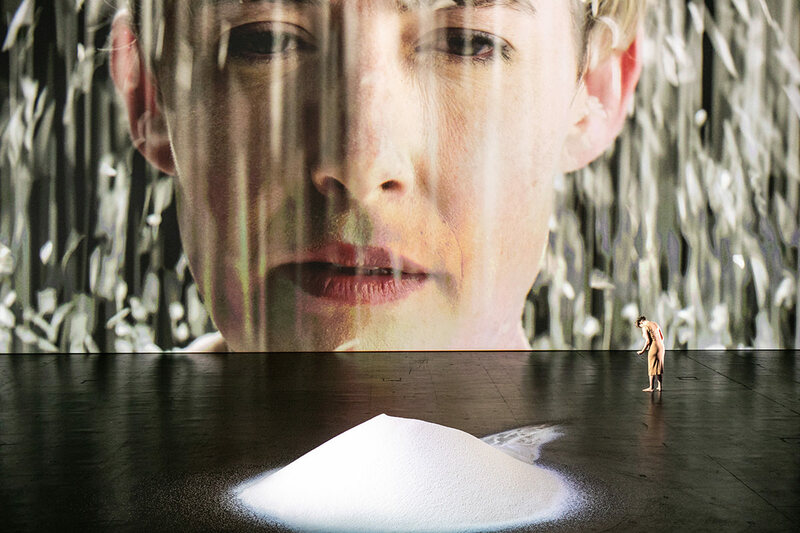 The boldest aspect of Sydney Chamber Opera’s La Passion of Simone has been the decision to actually represent Weil, onscreen and, in the mirror-imaging of Singer and philosopher, onstage. Simone Weil would likely have been appalled at the prospect of being literally represented — which she is not here; the images are symbolic of passages of her life. The libretto mentions a particular photograph of Weil, but this production wisely refuses to show it (some have not). On the page and in other productions, the opera belongs to the Singer, not to Weil whom we can only sense from snippets of her life, fragments of her writing, the choral underlining of her utterances. The drama that plays out is the Singer’s quest to understand Weil; it cannot fully succeed, ending with almost numb acknowledgement. In this production the Singer is turned away from us, locked, quivering, in one position for the opera’s entirety, minimising our direct identification with her, but underlining her problematic identification with Weil, with Sheldon as both Singer and the object of her projection. Sydney Chamber Opera’s risky decision to represent Weil, even if abstractly, and make her the focus of our gaze, is a bold one and a significant departure from previous productions I know of. On the night it somewhat diminished for me the sense of the Singer’s presence and her striving, if nonetheless feeling the intense stress of her quest in the singing. Now, on reflection, I vividly and satisfyingly recall, as one, the sad beauty of the Singer’s anguish and the transformation of Weil into Light, merging with cosmos, a decomposition with Grace, if leaving us too forsaken in troubled times. Once again I’m deeply grateful to Sydney Chamber Opera for staging a work I knew of but never expected to see and which has provoked thinking about opera and form, politics and faith.